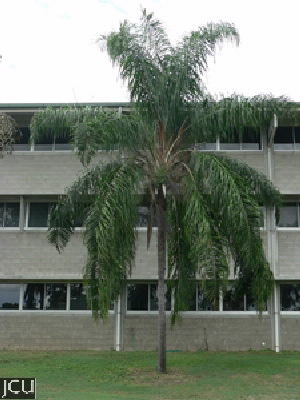 Formerly known as Arecastrum, this tall, solitary palm has the pinnae arranged in two rows which gives the leaf a feathery appearance. The fruit are 3 cm long and orange with a soft flesh. This particular specimen has now been removed and replaced by a new building.